We all know as Americans that the 4th of July is a time where we gather together and celebrate our nation’s amazing independence from the hands of tyranny and oppression. It’s a time where we acknowledge how our Founding Fathers were willing to sacrifice it all, their land, their livelihood, their comfort, and do whatever it took to secure and maintain our current freedoms. But the explosive truth is, most Americans, even Christian Americans, have no idea what in the world made our country so great and what it was that provided the amazing backbone of our Founding Fathers. 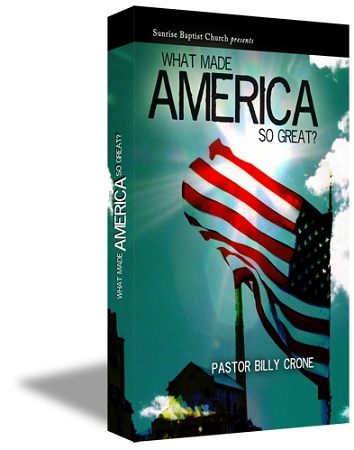 What Made America So Great was that America was founded on Christianity. Therefore, this study, What Made America So Great exposes the amazing three-step plan that was set up by our Founding Fathers to ensure our freedoms and maintain our country’s awesome power and vitality that’s now been deliberately buried in our history and erased from our textbooks by those seeking to enslave us once again. Our Founding Fathers simply purposed to have Jesus Christ put in our Government, our Schools, and in our Churches. This is the long forgotten secret to the genius and power of America. People, we need to wake up and deal with the facts. Once again we are under the hands of tyranny and oppression and if our once Great Nation is ever going to become Great again, we have got to get back to the secret of What Made America So Great!